Whether you're a gamer, an audiophile or both, boost your audio quality to the next level with this incredibly well-priced high-end sound card from Creative Labs. Sound Blaster Z, part of the ultra high-performance Z-Series of Sound Blaster sound cards, is an ideal all-round solution for your PC gaming and entertainment needs. It comes complete with the Sound Blaster Beamforming Microphone for crystal clear voice communication. Experience like never before the power of Sound Blaster audio today! 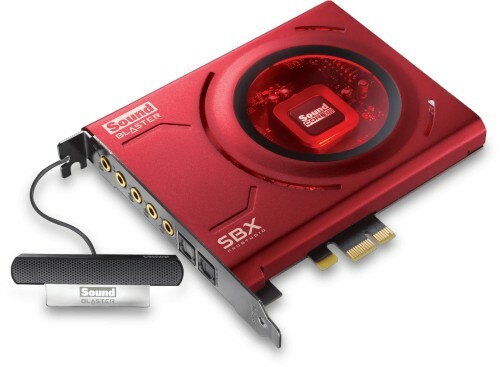 With Sound Blaster Zx's gold-plated connectors, speaker optimisation technology and digital content encoding capability, you can be assured of only the best digital audio possible. SBX Pro Studio sound technologies create unprecedented levels of audio realism, including stunning 3D surround effects for your speakers and headsets. Learn more about SBX Pro Studio technologies. In gaming, if you're not communicating, you're not winning. Experience crystal clear communication with your teammates with the CrystalVoice suite of technologies that removes echoes, ambient noises and picks up your voice from within a zone (Voice Focus). It also maintains your voice level even if you are near or further away from the microphone. The multi-core Sound Core3D audio processor is designed to offload SBX Pro Studio and CrystalVoice effects processing from your primary CPU, improving your overall PC performance, resulting in drastically superior audio and voice quality.